Ever since Quaking, Kathryn Erskine's books have been automatic reads for me. While Seeing Red skews a little younger than most of what I read it is oh, so good. 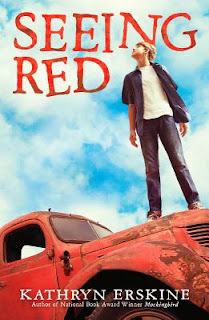 Set in 1972, Red, a twelve year old living in rural Virginia has just lost his dad. His best friend Thomas, a black kid a couple years older than him, has rejected him and the family business "Porter's: We Fix it Right," a garage/convenience store/gas station looks to be going under. Red is dismayed when his Mama decides to sell the business and move away. As Red tries to figure out how to stay in Stony Gap, he makes some bad decisions, learns a lot, discovers some historical family secrets, and begins to become a man. Erskine's stories always delve deep into what it is that makes a person human, what goes into their moral makeup, how they decide what is good and right. This is a terrific heart-warming but definitely not saccharine story that deals with real issues for the here and now as well as the role history can play in a family down through the years. This is one of the most touching, heart-wrenching, yet hopeful books that I have read. 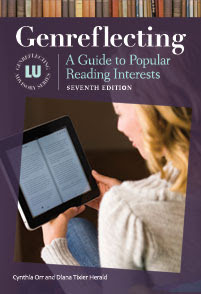 I hope that it can be found in school libraries all over my home state of Virginia. I fantasize that history teachers everywhere have this book to refer to and to share with their students. While Seeing Red is intended for, and perfectly suited for a Middle Grade audience; I cannot imagine any adult reading this book without shedding a tear.